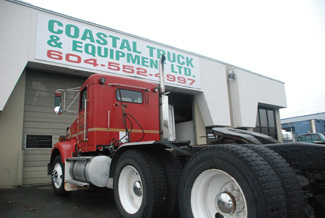 Welcome to Coastal Truck and Equipment in Port Coquitlam, British Columbia. We are the Lower Mainland's premier shop for repairs and maintenance on heavy duty trucks and equipment of all makes and models. Our CVSE certified shop can accurately troubleshoot your problem and make the necessary repairs efficiently so that your downtime is minimized. We also offer secure parking on our paved one acre lot. For more information on what we can offer, please visit our services page. Our office is open from 8am to 6pm on Monday to Friday and 8am to 4:30pm on Saturdays. Please contact us today to schedule your next visit by calling 604 552 4997.